The Metropolitan Council is a regional body, overseeing all of Minneapolis-St. Paul’s wastewater, transit system, housing projects, and regional planning efforts. One of the major goals of the council is to work increasingly more systemically and collaboratively not only within the organization but also regionally and with the communities they serve. The council also has come to understand that the amount and magnitude of change that they will be facing is only increasing. The general manager of Environmental Services, one of the council’s divisions, for example, has the vision to facilitate creating an integrated and environmentally sustainable water management approach by 2050. This vision is called, One Water. 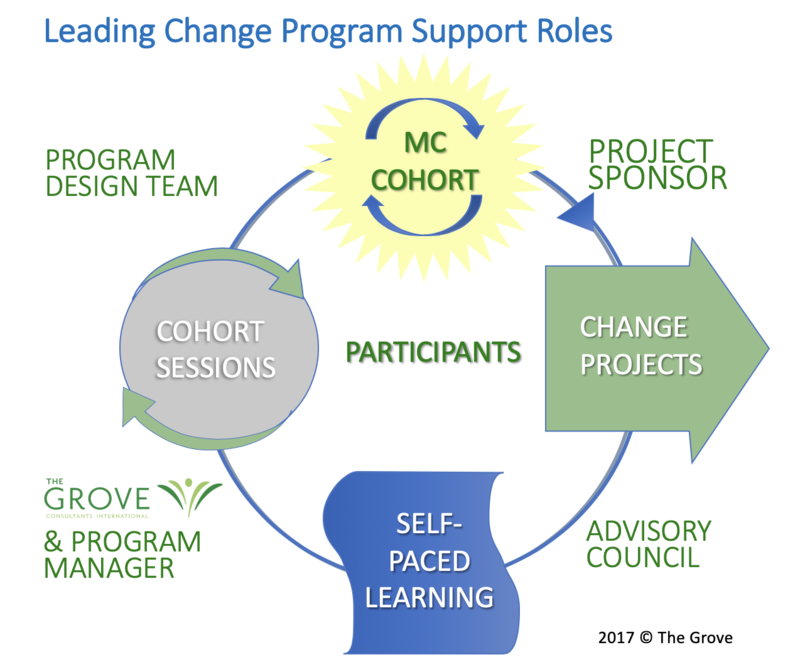 It is within the context of our client recognizing that more systemic and collaborative approaches to change are needed that we began fostering a partnering relationship with the council. I am delighted to say, the work with our client is continuing beyond the completion of this program and we are currently co-creating additional opportunities for more of their employees to increase their ability to work collaboratively and systemically, with a focus on supporting the evolving and increasingly rapid nature of change. This project allowed David and I to build on years of work we had done with a range of regional governments, environmental organizations, and stakeholder initiatives like RE-AMP (David) and The California Roundtable on Water & Food Supply CRWFS.(Gisela). This program also presented an opportunity for both of us to build on years of providing extended, action research, and cohort-based practitioner development going back to my roots directing the Masters Program in Organization Development at Sonoma State University and David’s with Coro. In addition, the Grove has a track record for helping evolve organizations who are dedicated to creating healthier communities and healthier environments. 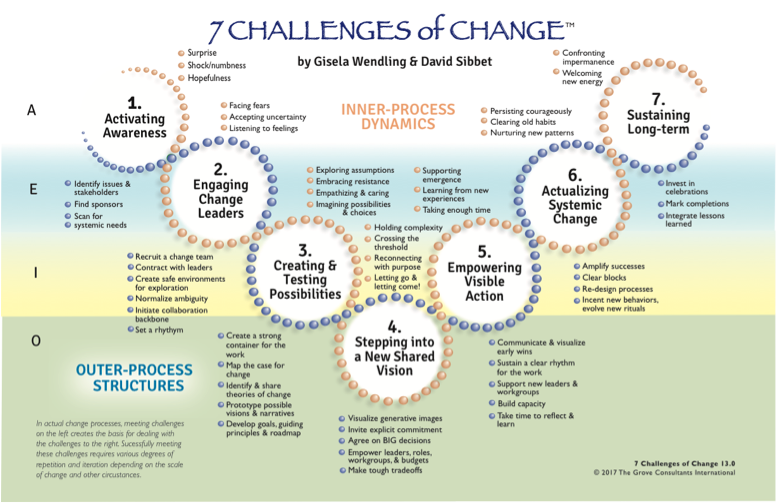 David and I used our Seven Challenges of Change Model as the content backbone for the Leading Change Program. We write about this framework in our book Visual Consulting: Designing & Leading Change, which was released in the Autumn 2018. It is written for consultants (both internal and external), facilitators and process leaders. Set-up a program design team to identify the objectives and overall format. This included a review of current strategic initiatives and identifying how to situate the program amongst these initiatives. Along with their senior executives, the design team identified change challenges from across the divisions that would serve as action learning projects for teams of participants. Encouraged our client to pull together an advisory council comprised of leaders of the participating divisions. They provided early input on the design and we clarified what was needed from them to support the participants over the duration of the program. Involving them was essential for creating and sustaining buy-in. Selected senior leaders were enrolled as sponsors for the change projects that the participants would be working on. One other key success factor was involving the client program manager not only on the design team but also active participant in the program. Her dual role enabled us to better gauge the effectiveness of the learning process on the part of the participants, stay closely involved with emerging dynamics within the organization, address issues as quickly as possible, and experience smooth logistical support. All sessions followed a similar format. New content was explored using short visual presentations, experiential learning techniques, group dialogue and through personal reflections. Topics and skills ranged from understanding systemic approaches to change, learning about different intervention methods, contracting for change, conducting systemic assessments, creating alignment across stakeholders, designing and graphically facilitating small and large group meetings, evolving organizational narratives, and more. Participants paired up to lead mini-workshops on topics such as decision models, facilitating dialogue, work process design, understanding wicked problems, and using ritual activities to stabilize or move change forward. These mini-workshops provided participants a low risk environment to apply their newly gained design and facilitation skills. In addition to working at small group tables we also used the large group circle format to support and model a range of group interaction methods. For example, the opening circle provided cohort participants a ritual-like process that signaled they were stepping into a trusted place for collective learning where sharing transparently about their discoveries and themselves as leaders was welcomed. The closing circle often became a space for affirming their mutual support for continuing their mutual learning and support in-between sessions. Project teams tackled one of four action learning projects focused on an organizational change challenge. For example, one of the strategic goals of the council was to significantly improve their capability to design and lead cross-sector collaborative engagement processes. As a result, one of the teams worked on initiating their regional multi-year planning process that included a range of institutions and communities. Another team focused on improving external customer focus. Below is a picture of David and I facilitating a roadmap session for that team to demonstrate a visual method for aligning on an action plan. Teams were comprised from across the divisions, supporting a level of exposure to the larger organization that is rarely available. These change projects were carefully scoped and supported to help the teams be successful and make a difference right away. The Seven Challenges of Change Model served as a guide for their project activities that the teams worked with from session to session. Through regular updates during sessions, teams were able to share and explore project challenges and opportunities and receive hands-on coaching by David and I, sparking rich program learning for all. The Metropolitan Council had made a huge investment into the program and it paid off. Their investment was matched by an equal level of personal dedication by the participants. And, they developed their capabilities as process and change leaders by creating visible organizational impact.